Home Jurassic World: Alive Jurassic World Alive: Epic Boss Strike Event: Counter-Strike! Welcome, Explorers, to this Strike Event guide! We’ve got another Boss Strike on our hands, this time featuring three counterattackers! Let’s see how to counter these counterattackers! We’ve got an amazing infographic thanks to our artist Orange Heart! These dinosaurs all have the Swap In Ability Swap-in-Ferocity, which means that they can boost themselves while swapping in! To add to the misery, all of these dinosaurs’ counterattacks are either Armor Piercing or Defense Shattering, so having armored creatures isn’t a good counter. All of these dinosaurs also have the ability to put up shields, and Diorajasaur can distract you with Distracting Impact, reducing your damage. Diorajasaur also has 30% armor, even further reducing your damage to it. Let’s see which strategies are good to defeating these counterattackers. Due to these dinosaurs all having a Swap In Ability, you can expect to see swaps a LOT. 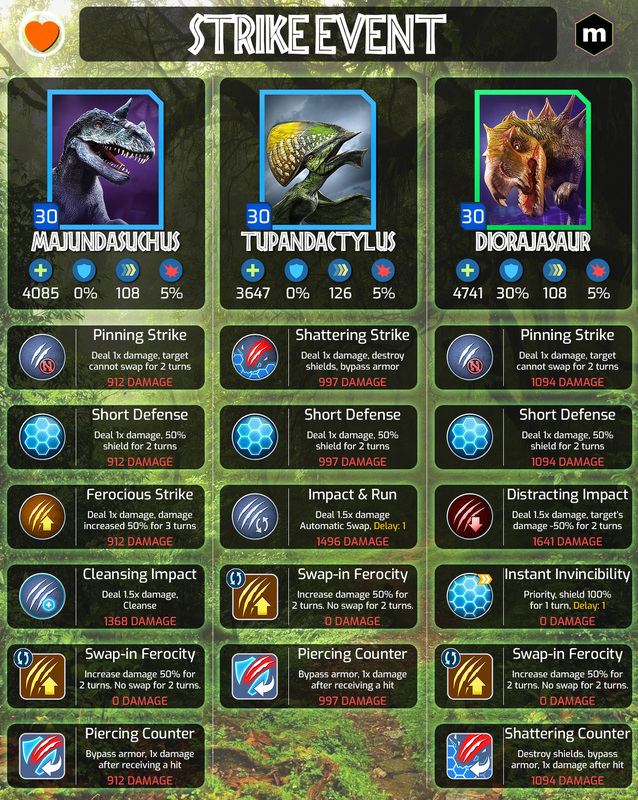 You can profit from these swaps by setting up with boosting dinosaurs like Tryostronix, Gorgosuchus, Postimetrodon etc. You can also pin these dinosaurs down if you don’t like all that swapping. Keep in mind that Majundasuchus has Cleansing Impact to cleanse the bound/pin it has inflicted! These dinosaurs all have the Ferocity effect when they swap in. To reduce the damage and possibly also remove the shields they put up, nullification is a good option to bring. Dinosaurs like Monomimus, Procerathomimus, Suchotator, Monostegotops and Magnapyritor can do this well. Three of these also have the ability to distract the opposing dinosaurs, which is also amazing! Distracting these dinosaurs basically means that they only inflict one hit on you, unless they cleanse it. Bleeding, while not as good due to all the swapping, is still an amazing thing to use this battle, especially if you expect a swap. Using a Lethal Wound or Swap In Wound at the right time can really put the hurt on opposing dinosaurs. Swap In Wound specifically, as it doesn’t trigger the counterattack damage, letting your Dimorphodon or Suchomimus use a Gashing Wound to really rack up the bleed damage. Dinosaurs like Suchotator, Dimorphodon, Suchomimus, Dimodactylus and both Spinosauruses are amazing dinosaurs to bleed these counterattackers. You need to watch out for Majundasuchus’ Cleansing Impact though! Stunning is also a good option, but not 100% reliable. Stunning these dinosaurs limits their damage output immensely, so if you can stun them, do it! Using dinosaurs like Stegoceratops, Paramoloch, Sinoceratops, Allosinosaurus and Utasinoraptor should give you a solid stunning lineup. Another option is to just chomp your way to victory. Dinosaurs like Trykosaurus, Indoraptor, Tryostronix, Gorgosuchus, Rex and Tyrannolophosaur are amazing dinosaurs to bring. Using Dracorex GEN 2 and Dracoceratops to finish opposing dinosaurs is also a good option if you can’t get the final hit in. Winning this strike will yield you an Epic Incubator. What’s in it? Could be everything! The DNA and coins vary depending on your player level. These dinosaurs are all level 30 and pack quite a punch. Don’t be frustrated if you couldn’t win, you certainly won’t be the only one. We hope you found this Strike Guide useful! Let us know how you did down below or in our Discord server!